Aetna, one of the most well-known and well-respected insurance companies out there sells a variety of Medicare Supplements, including Aetna Medicare Supplement Plan G.
One of the best values among the Medicare Supplements, Aetna Medicare Supplement Plan G benefits provide high-quality coverage at highly competitive prices. Aetna is one of the nation’s largest insurance companies and has been providing a broad range of insurance products for more than a decade and a half. It’s no wonder that so many seniors all over the U.S. trust Aetna for their Medicare Supplement plans. As they approach Medicare eligibility, many people assume that all of their medical costs will be covered and are surprised to discover that original Medicare covers only about 80% of their costs. That is where a Medicare Supplement policy comes in. An Aetna Medicare Medigap Plan G can provide coverage for hospitalization and medical services beyond what Medicare covers, so you can rest assured that both your health and your savings are protected. With a Medicare Supplement plan, like Aetna Medicare Plan G, you have reliable, dependable coverage that goes where you go. You are not part of a network, so you can see any health-care provider you like, as long as they accept Medicare, anywhere in the country. You also won’t be lured in with a great rate only to be hit you with a double-digit increase later on. If there is going to be an increase in your Medigap plan G premiums, Aetna will raise the rate for all policyholders, which means that new policies would have higher rates, as well. This uniform pricing helps to keep the costs down for everyone and makes the rates more predictable. There is also a 30-day free trial with Aetna Medicare Supplement plans, so you don’t have to worry about being locked in as soon as you sign up. Medicare Supplement Plan G is one of the most comprehensive of the Medicare Supplement plans, providing payment of virtually all of the copays and deductibles that Medicare does not cover. Aetna Medicare Plan G has become increasingly popular since it was introduced and its growth is expected to continue. While Aetna Medigap Plan G provides nearly comprehensive coverage, one thing that is not covered is the Medicare Part B deductible ($183 in 2017). Medicare Supplement Plan F, the most comprehensive of the Medicare Supplement plans, does cover this cost. When Jane and Bill Anderson from Tampa were shopping for Medigap Supplemental coverage, they were concerned about paying the Medicare Part B deductible and were leaning towards Plan F. But when they spoke with an agent and were able to compare quotes in Florida, they were surprised at how low some of the Aetna Medicare Plan G premiums were. In fact, some were so much lower than some of the Plan F premiums that they could pay the Medicare Part B deductible out-of-pocket and still save money. 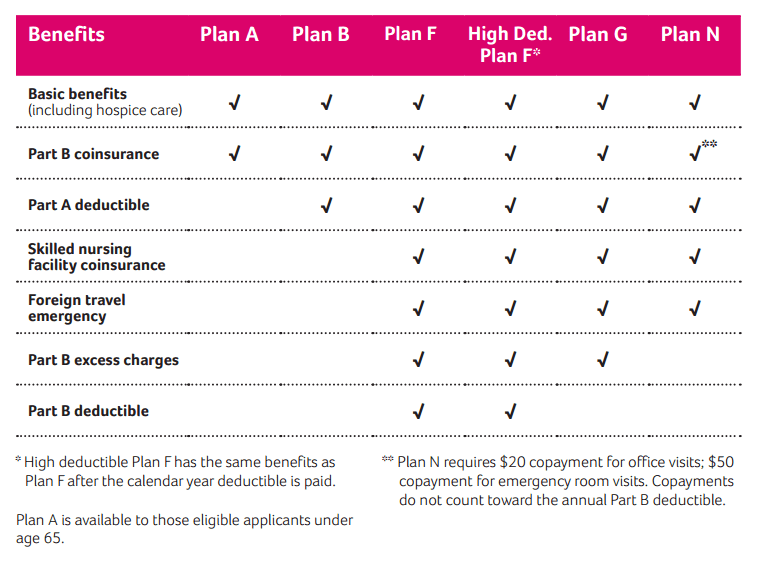 Why Choose Aetna’s Medigap Plan G? When you decide to give a company your hard-earned money for a Medicare Supplemental plan, you want to be sure that both the company and the coverage are the best out there. When you compare providers of Medicare Supplement Plan G, either online or by talking with an agent, you will see how Aetna stands out from its competitors. Aetna has decades of experience serving seniors, which is why they are a top provider of Medicare Supplement Plan G. The size of the company and their years in the business ensure that they have the resources to pay your claims in a timely manner, to answer any questions you may have and to resolve any problems arise. They have unparalleled online resources including a member portal that allows you to securely review your policy, update your information or explore Aetna’s other offerings. You can also sign up for personalized alerts to let you know when your payment is due or when it’s time for renewal. How Much Are Aetna Medicare Supplement Plan G Rates? One important feature of Medicare Supplemental plans is that, while the benefits are standardized, the prices vary by company and by state. Let’s look in on Angela, a 67-year-old retiree who is in the market for a Medicare Supplement. She plans to spend her retirement exploring the country and is trying to decide where to make her permanent residence. She was very happy with the Aetna policy she had through her employer and likes the coverage with Aetna Medicare Plan G. An agent worked with Angela to compare the rates she would pay in the 12 different states she is considering. The agent made sure to stipulate that Angela is a non-smoker since that affects the rates from some companies. *quotes are not endorsed or sponsored by any insurance company; we provide information based on our professional opinion. These are Aetna Medigap Plan G sample quotes ONLY, your quote may vary by age, health, and location. Will My Aetna Medicare Supplement Plan G Rates Increase? One of the unique features of Medigap Plan G policies, including the Aetna Medicare Supplement plan, is the administration of something called “guaranteed issue rights.” Say you had coverage through an employer, a union or another type of policy after you turned 65. If that coverage ended, you would then be guaranteed the right to purchase some Medicare Supplement policies without any health questions. To purchase Aetna Medigap Plan G, however, you would be required to answer some questions about your health. As a result, people with costly medical conditions may be excluded from purchasing Medigap Plan G, leaving a healthier group of policyholders. Healthy policyholders mean less cost for the insurance company, which translates to fewer cost increases to customers. That doesn’t mean that an Aetna Medicare Supplement Plan G rate will never increase, but it does mean that rates could be more stable and predictable over time. Since rules are different in some states, it’s a good idea to work with an agent to get the best information on how the plans in your state compare. Does Aetna Medicare Supplement Plan G offer Additional Benefits? When you purchase an Aetna Medicare Supplement plan, you not only get extensive Supplemental benefits, you have access to a wide array of services available to Aetna customers. Aetna provides members with discounts on health and wellness programs, such as gym memberships and weight-loss programs, as well as savings on eyeglasses, hearing aids and blood pressure monitors. You will also be entitled to Aetna’s Lifestation® Emergency Response System, a leading emergency medical alert system that offers round the clock security and peace of mind for seniors. Benefits like these are what make the Aetna Medicare Supplement Plan G the best choice for many seniors. To find out more about Aetna plans, you can use our online tool to access a customized quote. Just enter your state to start your Aetna Medigap Plan G quote. We also have licensed insurance agents who can help you compare plans, obtain quotes and find the best plan for you. Visit us online or give us a call.